CLACKAMAS, Ore. — People who want to learn how to fish for steelhead on the Sandy and Clackamas rivers are invited to a workshop at Glen Otto Regional Park in Troutdale on Saturday, Nov. 5. There expert steelhead fishermen from the Sandy Chapter of the NW Steelheaders will cover such topics as selecting the right equipment, common fishing methods, casting, finding fish, plus tips on how to cooking and smoking steelhead. 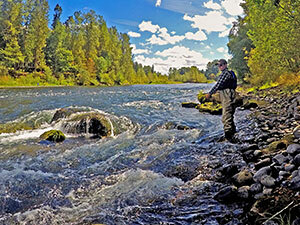 The event is hosted by ODFW and Sandy chapter of the Association of NW Steelheaders. The session takes place at the Sam Cox Building in Glenn Otto Park, 1102 East Columbia River Hwy., Troutdale, OR 97060. It will begin 8 a.m. and with classroom instruction and conclude in the afternoon with fishing from banks of the Sandy River at Glen Otto Park. Steelhead season will be open at that time and all participants will need fishing licenses. Snacks, soft drinks and picnic lunch are included in the registration fee of $52/adults and $22/youths ages 9-17. The workshop is limited to the first 30 registrants, and advance registration is required. Youths must be accompanied by a registered adult. No prior fishing experience is necessary, and all the gear needed will be provided. Participants are welcome to bring their own if they’d prefer. For more information on this or other opportunities to learn new skills, visit odfwcalendar.com or contact Mark Newell, (503) 947-6018, mark.newell@state.or.us.